Newly dedicated monument May 7, 2008 at the Ledge Street School and sports field, find the flag pole you find the Memorial Park - Nashua, NH. This Vietnam Memorial is to these 18 souls who "Gave All" for their Country. Vietnam Veterans Memorial Service at the NH State Veterans Cemetery,Boscawen, NH July 11, 2009 left to right: Purple Heart Riders Association President-Al "Scout" Grow, PHR Treasurer-Ray Belanger, PHR VP-Paul Martin, PHR Chaplain-Jerry Dumont. First in the nation state to create and issue New Hmpshire Medal Of Honor, Medal and Ribbon. 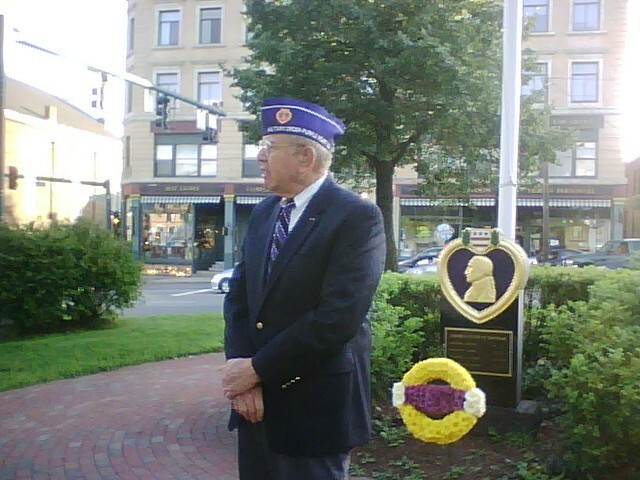 A short memorial ceremony at the "Purple Heart" Monument in Deschenes Oval RR Sq. Nasha, NH. at the WWII Memorial. MOPH 'Americanism Officer' Dave Smith, gives a short history on the "Purple Heart Medal" on Friday, August 7, 2009 at "Deschenes Oval" Nashua, New Hampshire. 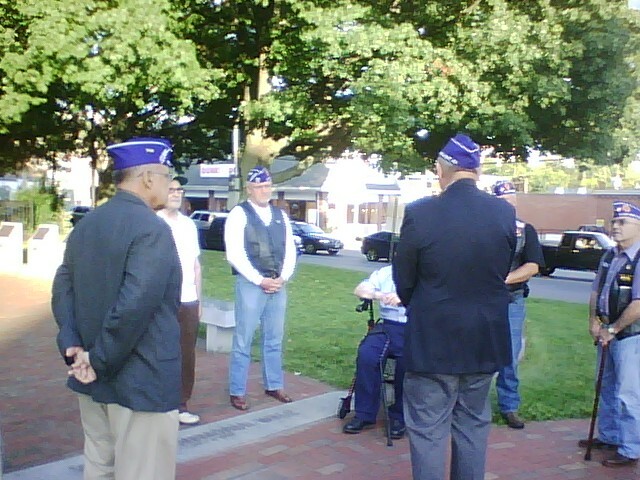 Members of MOPH Chapter 804 Nashua, N. H. attend "Purple Heart Day" ceremony. 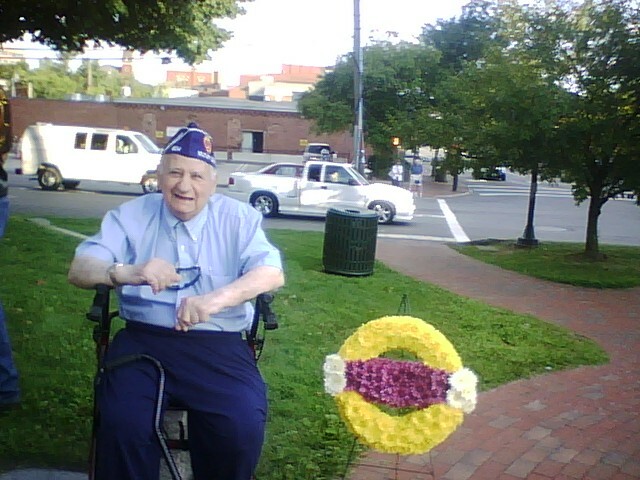 WWII Marine Corps Veteran "Tarawa" survivor, Maurice A. Sposato 92 attends the Purple Heart Memorial ceremony at Deschenes Oval Nashua, New Hampshire. "Purple Heart Medals" to Veteran POW's of WWII and Korea who died while in captivity. Opening Ceremony at the NH State Veterans Cemetery Boscawen, NH - Saturday, August 8, 2009 - First in the nation in recognizing "Purple Heart Medals" for POW's and their families of New Hampshire men killed in captivity during World War II and the Korean War. Certificates were given to 35 of 61 family members. Here is a wonderful video by the Pentagon Channel and it provides you with a behind-the-scenes look at the Vietnam Veterans Memorial Collection. Yesterday 7/27/2013 marked the 60th anniversary of the end of the Korean War. The Veteran's Center in Munford, TN hosted a cookout honoring these veterans. The Purple Heart Riders were there to support our fellow brothers in arms. Homeless Veterans Stand-Down Harbor Homes Nashua, New Hampshire. Below are the 2 links to the slideshow. The first preparing the wreaths, the seconded the laying of the wreaths. The first one is preparing the wreaths, the second was placing them. In 2004 Harbor Homes Inc. began operating a program geared specifically to honorably discharged homeless veterans called Veterans FIRST. Funded by a grant from the Veterans Administration, the Veterans FIRST program provides housing and support services for up to twenty four months to aid veterans in getting their lives back on track. Over 100 veterans have benifited from the program and moved on to independent living. This new facility, is named in honor of advocate and distinguished veteran Griffin Dalianis. The building will ensure that the sacrifices that our veterans make to protect freedom are not forgotten. Within the facility an Honor Wall will be created to pay tribute to the brave men and women who have honorably served our country. Bricks can be purchased and inscribed to include the name and branch of of the honored veteran. Womens Memorial, DC The Women In Military Service For America Memorial (Women’s Memorial) is the only major national memorial honoring all women who have defended America throughout history. We are proud to recognize their devoted patriotism and bravery as an integral part of our national heritage.